If you can't wait to see Dumbledore and Grindelwald fall in love with each other's ideas . . . 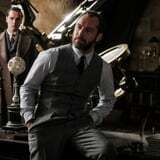 Fantastic Beasts: The Crimes of Grindelwald hits theaters on Nov. 16.